Provide fresh drinking water at all times , you can get travel bowls and bottles for this purpose. If a long journey make stops to take dog out for toilet breaks and stretch of legs. Always ensure you stop at a safe place. Never leave a dog alone in a car, especially on a warm or hot day. The temperature inside the car will be far greater than outside and even with the windows rolled down it doesn't take very long for your dog to overheat and can lead to brain damage or death. Dogs are not adept at cooling themselves and can only do so by panting and through pads on their paws. Remember that the inside of a car legally constitutes a public place. Anyone who is bitten if they stick fingers through your car window could report you under the Dangerous Dogs Act 1991. Don’t let your dog stick his head out of the window as he could get injured from other vehicles, trees or flying debris.Or he could see something interesting and try to get out. Dogs can suffer from travel sickness and anxiety like us humans which can brought on by motion, stress related or over excitement. Dogs may exhibit a variety of signs such as drooling, unable to sit and move around a lot, being vocal, rapid panting or actual sickness.Don’t feed your dog just before travelling as this will help reduce the likelihood of him suffering from car sickness. Other suggestions also include travelling with your dog on an empty stomach and ensuring the window is open enough to allow fresh air to circulate, but not open enough that he can jump out. You can also use non prescriptive calmatives such as Dorwests : Skullcap and Valerian which may help anxious dogs in stressful situations. ﻿Bach's Pet Rescue Remedy , drops you place on tongue. This can be a lot initially for a dog to take in depending on your mode of transport and the time of travelling and area that you live in. Lots of people, nosie, smells and the hustle and bustle especially if travelling in major towns and cities. Travelling in rush hour is best avoided unless there is no alternative. Be aware of travelling when weather is hot. Pets have to be under control and not present a safety issue. Not on seats and kept on a lead. Be respectful to other passengers not all like dogs. You might have to move to another area. Be mindful of other people travelling with their dogs especially if confined in small spaces or if the mode of transport get busy. Check with the operator to see their policies on travelling with pets before embarking on your journey. If using escalator ( London Underground for example) you must carry pets on. Introduce public transport to your dog in small stages, taking a short journey on a bus for example, or just visiting a train station. Try and choose a ‘quieter’ seat away from the more popular and busier areas of the bus/train. Ideally if you can away from children and larger groups of friends, until you know your dog is fine with travelling. Make sure your dog has been to the toilet before hand , but do have plenty of poo bags just incase an accident happens. Take some treats with you, this may help if they get stressed, and you can focus their attention onto you and treats to help calm. Take fresh water and some food for your dog with you incase of delays or if travelling for a long time. It is worth investing in a dog travel bowl. 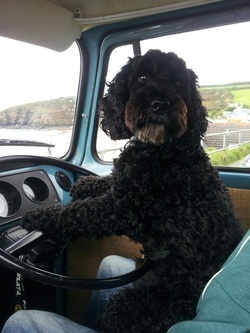 Plan your journey so that you dog has breaks if travelling for a substantial time. Ask the company about its policy towards dogs prior to booking, some may allow on decks but not all will. Often they will not be allowed on decks, they must remain either in the vehicle or in the kennels on the car deck which can be booked in advance. Advice for pet owners planning to take a pet to any EU country after 29 March 2019 in the event of the UK leaving the EU without a deal. This disease in prevalent around the Med, all of Spain, Portugal, Greece, Italy, southern France etc. The disease is transmitted by sand flies (nothing to do with sand they like damp places and are only active at night). A Scaribor collar is the recognised preventative measure as well as keeping your dog inside during the hours of darkness although this doesn't provide 100% security. There is now a vaccine, given in three injections over six weeks plus annual boosters. There is no cure for leishmania in dogs once contracted, although the symptoms can be ameliorated by a lifetime drug regime. By Club Member Derek Bell and his cockapoo Barney. These are my thoughts based on travelling in a campervan for seven weeks across Germany to Austria and back across Northern Italy and through France. We have had a van for around eight years and spent many weeks abroad both in the summer and skiing in the winter before having Barney, so I have also included some thoughts on our general experiences. Your vet will be able to advise on the necessary injections safety precautions etc depending on where you are going as these vary and change from time to time. The official govt website ( see the green link mentioned above) is also useful . I started by googling “taking a pet abroad” and took it from there. Our vet didn’t charge for the passport but I believe some do. GIVE yourself plenty of time , Rabies vacs have to be done well in advance. Get all the info that you have on your dog including insurance microchip etc together and take it. Check what your insurance covers. Barney has a second collar tag that has a mobile phone number, says “on holiday” and has the make and vehicle registration of our van on it. Maps, Sat nav etc are obvious. there are lots of useful books depending on where and how you plan to travel plus many schemes for cheap camp sites stopovers. “Vicarious Books” are an online supplier for most of these and will also give advise if you phone them. ( google them). We tend to use French Aires, German stellplatz for one night stops when travelling and Campsites as well. Vicarious books produce a book called “ All the Aires France “ plus others specifically for Skiing etc. These are different to the aires on autoroutes which i wouldn’t advise you stop on unless really pushed. Aires are usually for 5 to 100 vans close to towns cities and can be free or a few €. German stellplatz are similar and we have book of these as well. For campsites we started off using camping cheques from the caravan club but now use a dutch system called ACSI. you buy a book for the year which contains thousand of campsites across europe and also some in UK. off season (May, June, Sept ,Oct, dates vary from site to site) these sites offer discounted places from €12 to €18. The books come with a map and lots of details about the sites including whether they are dog friendly. Acsi books can also be obtained from Vicarious books. Think about where your dog will sleep, will he be in the van on his own, will you need a crate, how will you secure him when you travel etc. ( Barney sleeps on the floor and seats when we are not moving. we started suing his harness strapped into a seat as we do in the car but it was too far away from us for his liking and now he sits on the floor between our seats secured to the table behind via a strap attached to his collar to prevent him from getting under the drivers feet). Your dog is likely to be on the lead for longer than when at home so an extendable lead as well as conventional one is useful. you will also nee a method of tethering your dog when parked. We attach a long tape to the step of the vans to which we attach Barney so he can wander about but to distance that we determine, also allows him to get under the van if it gets hot. Think about how hot it may get (in Provence beginning of June we experienced 33C). Getting a short cut before you go might be worth considering. (Barney is really matted after swimming in Rivers lakes and the sea and would have befitted from a close cut before we left). Take a collapsible water bowl and a water bottle for when you are out and about. Measure up the amount of dog food you will need for the trip and any treats etc as you may not be able to get this abroad easily. ( don’t worry it disappears as your trip progresses leaving space for bringing home wine!). Your dog will need to be wormed before returning to the UK. A vet abroad will have to sign your pets passport to say this has been done and will supply the wormer at a cost, we take our own. You will also need any flea tick etc treatments that are due when you are away. Before Barney ,we have always used ferries as they are cheaper but with him we used the tunnel. If you use a ferry the dog will have to remain in your vehicle for the duration and whislt this is only a couple of hours we were concerned that if a dog in an adjacent vehicle;e started barking or a car alarm went off Barney might be less than impressed. I searched around fro the cheapest cross in price, they vary a lot and booked fro Sunday morning early. We turned up Sat evening planning to sleep at the terminal and got a crossing straight away. Coming back we also got on the crossing an hour before, both at no additional cost. Other Ferrys - we are off to Greece in August from Venice to Patra on a ferry with camper deck, you plug the van in the boat and use the van as your cabin, so fine for dogs. Where can dogs go and where can’t they. Our continental cousins are generally much more relaxed when it comes to allowing dogs into shops restaurants etc. there were very few shops when Barney wasn’t allowed in and the same with restaurants although we did eat outside whenever possible. We have used public transport in France and Austria without problem. In Italy dogs have to be muzzled on all public transport, buses, trains and boats. We bought a cheap plastic affair that is collapsible although haven’t had the need for it so far. At the risk of stereotyping we found that people were much less interested in your Dog in Germany Italy and Austria. Italian dogs didn’t seem very well socialised and allowing dogs to say “Hello” not the norm. The French were more interested and often asked the breed, I always stressed the poodle connections! In Austria Italy and France we found lots of poop bags dispensers in towns parks etc which helped keep us topped up. Think about how many you may need for your trip. Most restaurants had water bowls on tap but would always fill up the collapsible one we carry, the standard joke usually revolving around whether he preferred still of sparkling! Fuel costs vary significantly from country to country. Diesel is cheaper in France than the UK so arrive with an empty tank not a full one. Around €1.27 a litre from supermarkets substantially more on autoroutes. Same in Germany and Austria. Italy is more expensive around €1.46. The cheapest fuel can be found in Luxembourg. Costs can also be kept down by avoiding the expensive autoroutes and autostradas. If crossing the Alps you will need to go through Switzerland or Austria and will need to buy a vinette to allow you to travel on their motorways. the Swiss one is more expensive but lasts a year the Austrian on much cheaper but lasts ten days. The vignette for Slovenia is very expensive. Check exact prices and weight restrictions etc on line. We had to use French vets on two occasions and they were extremely helpful. Check campsite details to make sure they accommodate dogs before arriving. We also take bikes and have a pannier and dog basket on the front which Barney is happy to travel in. It allows us to go abit further afield than walking and gives him break if its hot. ( I struggled to find a basket in the UK bought a wicker one which was fine when he was puppy but disintegrated in Italy where a bought a decent plastic one and a good front pannier. The dutch have all kinds of weird and wonderful contraptions. I have also seen a few dogs being towed on trailers. We have been around Greece couple of times around France a lot. Down the length of Italy and around Sicily, as well as the Italian lakes. Know Austria reasonably well and have been across Germany a few times. Been down as far as the Ebra delta in Spain. Should anyone require specifics on anywhere in particular then please Pm me on the clubs facebook page. You need to get your dog checked wormed and Passport stamped by a Vet within five days of returning, its cheaper away from the coast and cheaper in Germany than France apparently. Thanks to Derek for sharing personal experience and tips with us.